I first began writing about palindromes when blogging for PhDiva, a superb blog run by classicist and archaeologist Dorothy King [Post HERE]. I will always be grateful to Dorothy for encouraging me to begin blogging, and just as I have continued to write, I have continued to be interested in palindromes, acrostics, and the use of writing for play. 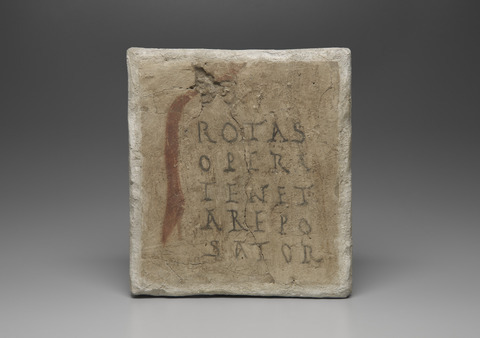 The Sator Square from Dura Europos (c. 165-256 CE) is now at the Yale University Art Gallery. Photo is in the Public Domain. As I was going through the Yale art collection from Dura-Europos this morning, I came across an incredibly popular ancient acrostic-palindrome called the ‘Sator Square.’ I will come back to the meaning of this puzzle in just a moment, but first, let’s explore the terms. The term “acrostic” has Greek origins. It is a combination of ἄκρος (the most extreme point) and στίχος (line or row). The first letter of each line forms a word or sentence. The word palindrome also has a Greek etymology. It comes from the word παλίνδρομος which means “running back again.” A δρομεύς was a runner. Palindromes were often used in magical incantations and spells. As I have stated before, they retained their power whether read backwards or forwards; their inscribed symmetry held potency. Much as Denzel Washington’s incredibly symmetrical face is read as beautiful, reading symmetrical writing also held an attraction for the eye. A late antique amulet from Cyprus found in 2011. It has a 59 letter palindrome. Photo by Marcin Iwan. It is an artifact from the excavations of Jagiellonian University in Krakow. A great late antique example was found at Nea Paphos on Cyprus in 2011. Joachim Silwa has published extensively on the siltstone amulet, which has a depiction of a mummy (likely Osiris) on a boat, with the god of silence, Harpocrates, above him. It is an ιαεω- palindrome (with a couple of mistakes), a formulaic palindrome that can also be found in the Greek magical papyri for various spells. The use of magical palindromes was likely a Greek invention, even if there were Egyptian themes often incorporated (Gordon 2002: 86). Palindromes were also important in the Roman world. In Latin, a word read both ways was later called cancrine (“crab-like”) or, if it retains the same meter backwards and forward, was a reciprocus versus (“reciprocal or back and forth verse”). The fifth century CE poet Sidonius Apollinaris proclaimed: “Roma tibi subito motibus ibit amor” (“Rome, to you love will come suddenly with passion”) [Ep. 9.14]. Romans just loved the fact that Roma, backwards, was amor. Alright, now let us return to the famed Sator Square. The square can either read “Rotas opera tenet Arepo sator” (as the Dura-Europos one does) or “Sator Arepo tenet opera rotas.” It roughly translates to: “The planter, Arepo holds the wheels with effort.” There are three examples of the Sator Square from Pompeii alone (other comes from across the Mediterranean, including Britain, Portugal, and Syria). 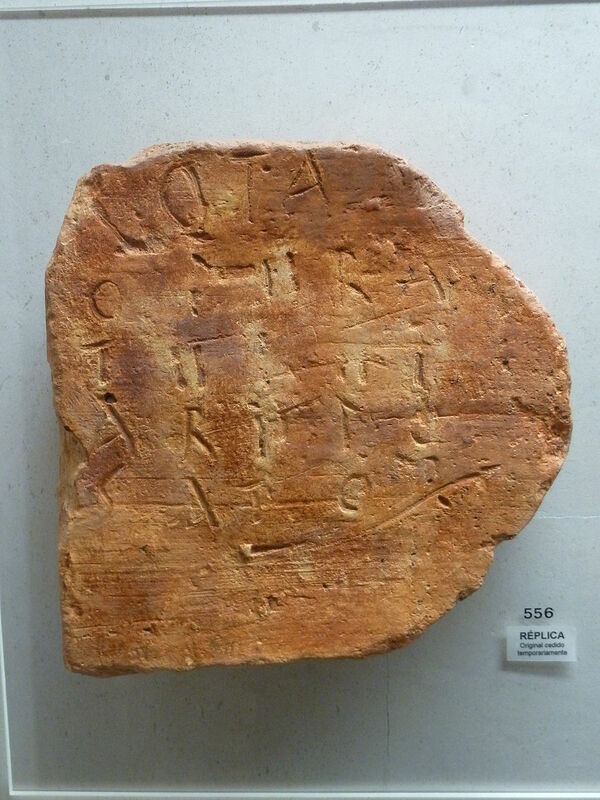 In addition to the Sator Squares, another Pompeian magic square reads: “Roma / Olim / Milo / Amor” (CIL IV, 8297) “Rome, once, Milo love.” This is admittedly rather hard to translate without a verb, but, like many acrostics and palindromes, the focus is on the visual rather than the meaning. The best article on the magical Pompeii squares is from Rebecca Benefiel (my former colleague at Washington & Lee and head of the Herculaneum Graffiti Project). As Benefiel rightfully notes, “enjoyment of word-play and mental acrobatics radiated deep through ancient society…The graffiti of Pompeii thus testify to an active culture of writing and reading, not solely for the purpose of communication but also for simple enjoyment.” (2012: 65, 78). Even if you weren’t fully literate, you could enjoy letter symmetry and wordplay visually. That remains a part of the beauty of the palindrome. As I and many others have previously said, the Sator Square was likely not early Christian at its inception; however (like many symbols, rituals, and writings) it was absorbed and then adapted as part of early Christian wordplay. Some examples show that it was still used as a kind of potent charm. Medical medievalist Monica Green was kind enough to send over an example from the 12th century Latin medical text called the Trotula. In the text, directive are given to women who have miscarried, so that the fetus can come out. As Green translates: “ Or let these names be written on cheese and butter: + sa. e. op. ab. z. po. c. zy. e pe. pa. pu c. ac. sator arepo tenet os pera rotas and let them be given to eat” (2002: 80). Into the medieval period, palindromes still held their power. The medieval Trotula also has a Sator Square. Para. 98 from Vatican, BAV, Pal. lat. 1304, f. 42r. Picture via Monica Green (With my profuse thanks!). The Sator Square also continued to be a part of the epigraphic landscape. A 16th century church in Essex has a graffito of the square, and it continues to be popularly inscribed today across the Western world. Palindromes in general require a great deal of skill, and are still a mental exercise enjoyed by both writers and readers. Rather recently, comic, writer, and proud Greek Demetri Martin wrote a 224 and then 500 word palindrome. As these inscriptions continue to prove, the visual layout of an inscription or a sentence in a book could be of even more significance than the actual meaning of the word. Their symmetry, when combined with the practice of reading aloud (which Romans and Greeks often did as they read) could activate powers that could be used for love, health, or just a good laugh. A Roman era Sator Square from Conimbriga in Portugal (Image via Wikimedia).